In Journal of Researches (1839). After returning from his famous voyage on the H.M.S. 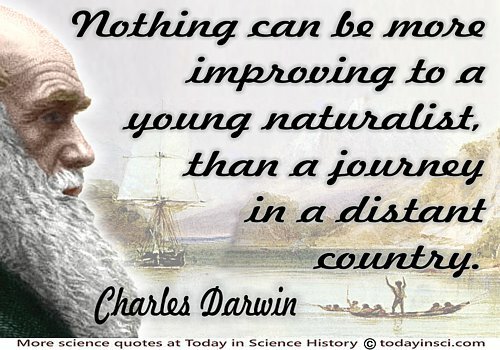 Beagle, as the ship's naturalist for Captain Robert FitzRoy, Charles Darwin and the Captain wrote of their experiences in a three-volume series of books. Captain FitzRoy wrote the first two volumes, which include his report on the ship's hydrographic survey, meteorological records and some amateur naturalist contributions. I have too deeply enjoyed the voyage, not to recommend any naturalist, … to take all chances, and to start, on travels by land if possible, if otherwise on a long voyage. He may feel assured, he will meet with no difficulties or dangers (excepting in rare cases) nearly so bad as he beforehand anticipated. In a moral point of view, the effect ought to be, to teach him good-humoured patience, freedom from selfishness, the habit of acting for himself, and of making the best of every thing, or in other words contentment. …Travelling ought also to teach him distrust; but at the same time he will discover, how many truly goodnatured people there are, with whom he never before had, or ever again will have any further communication, who yet are ready to offer him the most disinterested assistance. 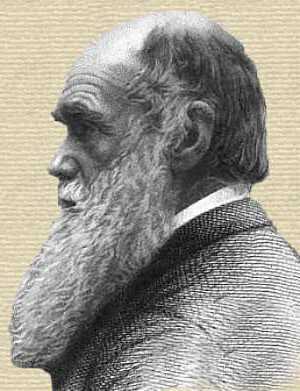 Thus, in his final words of his last chapter, Darwin's thoughts are not just about the novel things he saw in other parts of the world, but he pays his lasting respect to the people he met along the way.